Dental health is of utmost importance to your horse’s well-being. Dental health is of utmost importance to your horse’s well-being, whether it is a retired companion or a performance athlete. 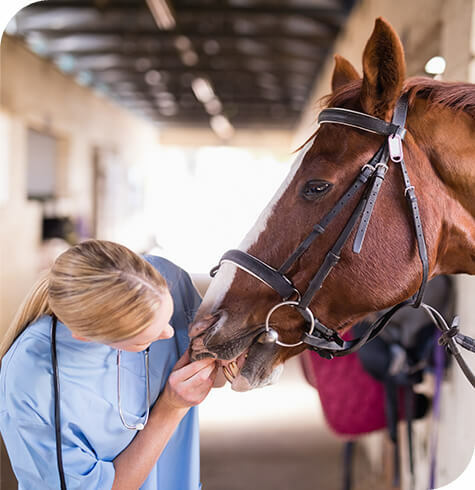 Our vets are trained to assess your horse’s mouth and provide any treatment required. We recommend that your horses teeth are examined at 6-12 monthly intervals; although 3 months may be recommended for some horses. It is often beneficial to carry out dental work under light sedation; this allows a thorough examination and assessment to be performed. At Aireworth Vets we offer dental visits whereby routine dental treatments (consultations, wolf teeth removal, routine floats) can be carried out. If 3 or more horses at the same yard are booked on a dental visit, the visit fee will not be charged. We have modern diagnostic equipment and necessary skills within our team of vets to treat most dental issues that your horse may have however should your horse require more advanced treatment we have regular visits from Chris Pearce CertEM (Int Med) CertES (Soft Tissue) Dip.EVDC (Equine) BAEDT MRCVS. European and RCVS Recognised Veterinary Specialist in Equine Dentistry from The Equine Dental Clinic. The vets are happy to refer your horse to attend the practice on these days for further treatment of more specialised cases.